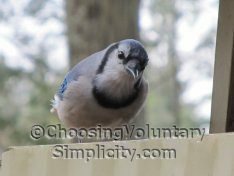 Home » Reader Questions / Simple Living / Voluntary Simplicity » Why Would Anyone Deliberately Choose a Simple Life? 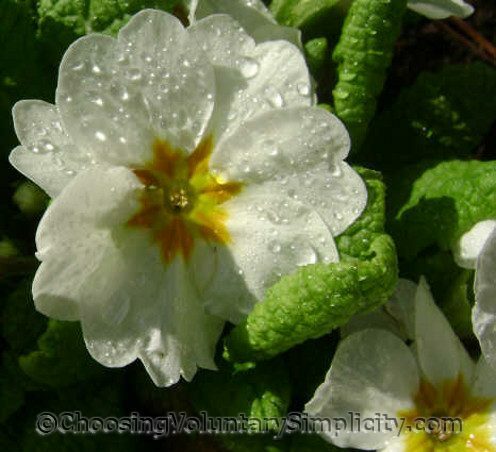 Reader question… “I’m wondering why would anyone deliberately choose a simple life. I’m drawn to the concept of simple living but I don’t see how I could be happy living the life of purging, scrimping and deprivation that I keep reading about in other blogs. I came across your blog by accident and I was surprised to discover that your life actually doesn’t sound that much different than mine. Your gentle approach to simplicity seems very sensible and understandable and so much more attractive. How can there be such a difference? Could you share your thoughts?” –Leda T.
First let me say that I agree… I wouldn’t be happy living a life of purging, scrimping, and deprivation either… but that’s purging, scrimping, and deprivation, NOT simple living. Done right, simple living should be a positive experience, not a negative one… with the emphasis on adding to your life, not taking away from it. You are the only person who can create a lasting simplicity that is a unique fit for you because simple living is indeed a concept. The reality is different for everyone, and a simple life that is ideal for you won’t be exactly “right” for me or for anyone else… and that’s the way it should be. But that’s also the reason why one set of simple living rules and guidelines don’t work for everyone. Everyone can follow them for a while and make changes in their lifestyle, but those changes won’t make a positive difference if they don’t fit who the person is. That’s why simple living is such a yo-yo lifestyle for so many people. Often the first step towards simplicity is a massive purge… and although purging will open up your space, eliminate clutter, and make you feel more organized, a truly simple life is about so much more than material possessions. Once you have honest answers to these questions… and you may be surprised by some of your answers… you should be able to see where you will want to make changes. A good start would be to work towards minimizing or eliminating the elements in your life that are causing you stress, wasting your time, and dragging you down emotionally. Make only a few small changes at a time, make adjustments, and realize that the reality is that every change won’t necessarily work for you. Remember that long lasting simplicity is an ongoing process. Your eventual goal should be to give up only those things that aren’t important to you so that you will have more “room” in your life for the things that are. We’re what I call “gradual minimalists,” which means we’re slowly having less stuff. Slowly getting rid of stuff we DON’T USE ANYWAY, not stuff we want. Learning not to buy stuff we won’t appreciate. Maybe this isn’t true for you (Leda), but we’ve found we have a ton of stuff that never gets used. I have a bunch of things others might think are silly like 11 kinds of flour, but I use them. On the other hand, we got rid of the donut pan because we never used it. It makes us a lot happier not to have stuff we don’t want anyway cluttering up our lives, and certainly not to keep buying stuff that we end up regretting. How interesting. I sat down to write a blog post today and really wasn’t sure where it was going and it turned into a question about why do people need to define themselves by what they own. Yet at the same time living simply is not about adopting a hair shirt. It is about being grateful and appreciative of what you do have and only have that which you need or love. ” Eliminate the unnecessary so that the necessary may speak.” Hans Hoffman is a quote that I use to define what to keep and what to get rid of. I am so looking forward to this series. I’m intrigued by your different approach and I’m struggling with those questions. I have questions for you too – have just sent them to your link. Great start to what looks like will be a great series. I’m very interested in this topic. Like your questioner I have been attracted by simple living but I am very put off by the idea that simple living means depriving yourself of everything. I’m sure that isn’t what it’s all about. Thank you for going into this topic. I enjoy your blog and I’m looking forward to your future articles. Thoreau said “Simplify, simplify, simplify.” Although I do like my “things” I truly appreciate simpler things in life like watching it rain or snow, a bright sunny day, great music, cooking, taking photos, reading, watching movies, etc. You hit the nail on the head when you said each person’s “simple life” is different.